Barry Bonds is unequivocally the greatest baseball player of all time. And with that, I have triggered a large section of my audience here. Steroids are a touchy subject amongst some baseball fans, and an entire generation of greats is currently being kept out of the Hall of Fame over a vague debate about what constitutes “cheating.” Barry Bonds and his ilk have violated the Sacred Laws of baseball, while others who have also committed grave crimes per the Sacred Laws (like the universally beloved Willie Mays), get off scot-free. It’s an infuriating debate for Millennials to have, as we are essentially told that our lifetime of baseball experience is a lie. It’s not—our lifetime of political existence has been a lie. We were told that the 1990s represented the End of History, as capitalism “won” the Cold War the moment the Berlin Wall fell. Bill Clinton capped off the decade-long celebration by removing two of the four planks of Glass-Steagall (busting down the firewall between investment banks and FDIC-insured ones), then George W. Bush finished the job by handing out free money to anyone who ever had a thought to buy a house, while Wall Street made so many wild bets on the housing market that it literally collapsed like a house of cards when 2008 came along and broke down the rest of the lie that was America’s economy. Shared prosperity is a myth as far as Millennials’ learned experience is concerned. Our elders have spent a lifetime dogmatically exclaiming the inherent superiority of America’s economic ideology, and we have revolted. Over half of millennials do not believe in capitalism because what is hailed as “capitalism” has looked more like one big shell game to those of us who graduated in the wake of the worst economic catastrophe since the Great Depression. How we arrived at this moment is a complex tale that is better suited to the pages of a book than the annals of an online magazine, but it can ultimately be boiled down to a simplistic phrase: more capitalism, less government. Starting in the 1980s, a new supply-side ideology took root in America, and our economic policy became consumed with funneling money towards the richest among us. The highest income tax rate plummeted, and the top bracket contribution to this chart practically disappeared at the same time. The 1990s weren’t the End of History, the 1980s were, and not in a good way. Like the baseball Hall of Fame, America has overlooked worthy policies in favor of adhering to a broken ideology that continues to prove its fundamental hypocrisy each and every day. Let’s begin on the baseball side of this analogy. When it comes to hitters, there are no better expert witnesses than pitchers. If we only go by choices willingly made by major league hurlers, Barry Bonds is easily the best batter ever. For those here solely for the political side of this analogy: an intentional walk is exactly what it sounds like. Aside from instances where it’s used to set up a double play or to get a pitcher to the plate, an intentional walk is a pitcher surrendering first base for free, because giving the hitter a chance to hit would be far more detrimental than advancing them 25% of the way to their goal. It’s a pretty rare event in a sport where the highest on base percentage of all time is still under 50% (Red Sox great Ted Williams made an out 51.8% of the time), so if a pitcher isn’t even bothering to pitch to you, it means you’re so white hot that you’re presently made of the same stuff as the interior of the sun. Major League Baseball was founded in 1869 in Cincinnati, Ohio. Here are the all-time leaders in intentional walks. Try not to laugh. — 26.3% of Bonds’ 12,606 career plate appearances ended in a home run or a walk. — He drew more intentional walks than any other team in baseball from 2001 to 2004. — From 2001 to 2004, he played in 573 games and reached base in 94% of them. Hold on, we need to take a moment to appreciate the absurdity of that last one. Michael Jordan is depicted as the avatar of American sports greatness, but he never had a stretch remotely as dominant as this. It would be like him shooting 75% for four years in a row. From 2001 to 2004, Bonds was the first man in history to prove the fundamental laws of baseball false. Forever and ever, on an equal playing field, the pitcher had the advantage over the hitter. From age 36 to 39, Bary Bonds became the first hitter ever to truly pose a bigger threat to pitchers than pitchers did to him. His stat line over those four years is one of the most alien things I’ve ever seen. The 284 intentional walks would rank 4th all time, and the 209 home runs are more than Hall of Famers Kirby Puckett and Bill Dickey. He did this in four years! At the end of his career! Turn of the 21st century Barry Bonds was the most devastating force that baseball has ever seen. I don’t care how many steroids you take, at that age, you don’t have that kind of hitting prowess without being some sort of god. I’ll leave you with one last Bonds factoid, then start to get into what this has to do with politics and economics. 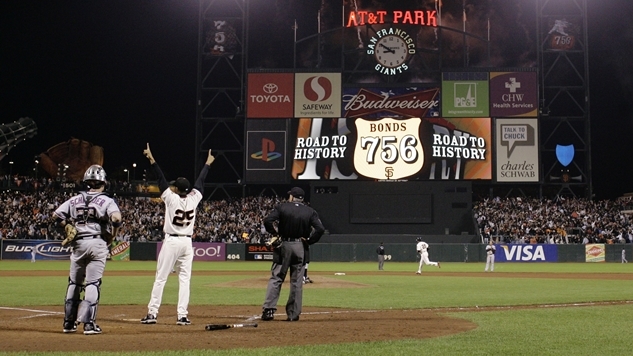 — In 1998, Bonds became the first player to ever hit 400 career home runs and steal 400 bases. — He was also the first ever to reach 500 home runs and 500 steals. — He is still the only player to reach both of those marks. Barry Bonds is the best baseball player ever and if you disagree with me, you’re wrong. If you take my stat nerd argument to its logical conclusion, we arrive at the crown jewel of modern baseball analytics: WAR. It stands for “wins above replacement,” and you may remember its derivation from Jonah Hill’s famed scene in Moneyball. The advent of WAR exposed how poorly baseball valued certain kinds of players. This has spurred a backlash against “analytics” by those who do not like to alter their reality to meet new evidence. The “best ever” debates across all sports now are typically reduced to virtue signaling, and “problematic” cases like Bonds are pushed to the side in favor of a more simplistic narrative. Whether or not you agree with my assertion on Bonds, you must concur that it’s absurd that the Hall of Fame—a baseball museum—does not have the all-time and single season home run king represented in some form. Or the all-time hit king in Pete Rose. Or perhaps the best pitcher of the steroid era in Roger Clemens. Or a litany of others smeared by an imperfect era. Are we really not going to have anyone from the 1990s in the baseball Hall of Fame? That’s the standard now? Yes, tons of players like Barry Bonds took steroids in the 1990s. But a cocktail of performance enhancing drugs (and cocaine) flowed freely throughout the 1970s and 1980s, the towering pitching mounds gave Sandy Koufax and Bob Gibson a dramatic advantage in the 1960s (hence why they reduced mound height by as much as 50% in 1969), and the entire century preceding them was solely a white man’s endeavor. To put a cherry on top of how difficult it is to truly compare eras in baseball, when Babe Ruth broke the home run record with 54 in 1920, the previous record was 29 (set by Ruth in 1919—he also led the league with 11 home runs in 1918). When Bonds broke it with 73 dingers, he surpassed Mark McGwire’s 70. Bonds was hitting against roided up pitchers working off a century of baseball progress. Ruth was facing some all-time greats like Walter Johnson, but most of MLB consisted of pasty white guys about my size (5’8” 160 lbs). They were practically playing different sports. Every era of baseball has its warts, and this purity test of Sacred Baseball Law is impossible to consistently enforce when applied to reality. The same thing can be said about our attitudes towards capitalism and how we manage our economy. We choose to believe things about The American Dream that simply have been proven false by reality (like upward mobility). “Socialism” is a boogeyman in our hyper-capitalist age, despite the fact that America has turned to something resembling socialist governance more than once in our history (Google “New Deal” if you don’t believe me). Yes, steroids had a huge impact, given that longtime home run records were all smashed during that era, but they affected the entire sport. Not just Bonds. Just like “greenies” (amphetamines) dotted the landscape throughout Hank Aaron and Willie Mays’ careers—and Mays is far from the only one who took them (we knew he did in 1985 and he admitted to it, yet we still compare Mays as completely clean to Bonds’ dirtiness—it’s bizarre). In Doc Ellis’ retelling of the greatest no-hitter ever (which he threw on LSD—the video below is well worth your four minutes), he claims that 90% of players in his day were on greenies. We just can’t truly compare different eras in baseball—we can only juxtapose portions of careers when the underlying conditions call for it. This is where we veer towards politics, as America is still searching for a policy platform that works in the 21st century. There is much debate about this country’s past successes and failures, but it seems like we are not learning the right lessons from our history (or learning our history at all). The story we tell ourselves is not based on empiricism, but ideology. This is not the first time that America has experienced this kind of dire inequality. There are policies from our past which have proven to work, but we choose not to consider them anymore because they don’t fit into the neat little story we’ve told ourselves about “capitalist” America—just like baseball Hall of Fame voters refuse to see Barry Bonds, Roger Clemens, Mark McGwire, etc…for the titans of the sport that they always have been. Ideology is a hell of a drug. Like baseball, the American economy can be mostly expressed on a spreadsheet—and as the Facebook scandal reveals, it goes down to the very last detail. We live most of our lives online, and that information is stored in massive data centers, then sold to advertisers who shove more targeted advertisement in our faces. When Russia does this, it’s called disinformation and we all freak out. This is the norm of American life in 2018. Dystopia is here along with President Trump, and we update the decline of our empire with our posts each day, which are then farmed out to start the process anew. A handful of corporations control damn near every industry in this country. America is proof that without strong anti-trust laws (which we have, but refuse to enforce), capitalism inevitably descends into monopolies and oligopolies. It’s impossible to argue in favor of capitalism without accompanying robust government regulation, which is something of an indictment of the fundamentals of the belief system itself. Now we find ourselves stuck in a situation where our government refuses to enforce these anti-trust laws, and we are told to tolerate oligarchy because our government is bought and paid for by every special interest under the sun. We have all become paralyzed as to how we can escape this toxic combination of Too Big To Fail and rampant corruption, and this is where I believe that lessons from the baseball analogy come into play. Baseball: If Barry Bonds should be kept out of the Hall of Fame for steroids, should Willie Mays be yanked out for being caught with amphetamines in his locker in 1985? They’re an automatic 50 game suspension under the new steroid rules. If not, and Mays stays, does that mean that amphetamines are less cheater-y than steroids? What’s the order on the badness of banned substances? Which ones preclude you from the Hall of Fame? And what about Toradol!? See how stupid this whole steroids debate gets once you drill down into it? Capitalism: If capitalism really does make everything better all the time, how come our era of low-taxation and even less regulation hasn’t produced widespread prosperity? Again, this isn’t up for debate. These two charts are undeniably correlated. Part of the problem is that America has deviated from what made our economy strong, and it’s really not that complex: a robust investment in the middle class. That kind of large-scale investment is now smeared as “socialism.” The idyllic age of the 1950s and 1960s held up by many Baby Boomers as the pinnacle of humanity was defined by higher taxes on the rich, and huge government programs to help some of our most vulnerable (the fact that the Civil Rights Act was signed in 1964 tells you all you need to know about how rooted this fantasy is in reality). The two most popular government programs of the last half-century are Social Security and Medicare. Call them the Barry Bonds of this analogy. At a certain point, America accepted that capitalism will inevitably let some people slip through the cracks, so we devised both a health care and a retirement guarantee for workers that the market has deemed too old to employ. The fight over “socialism” in the Democratic Party is a bit insane, as the “Bernie Sanders faction” has been portrayed as an insurrection, as opposed to being the successor to an existing coalition which ruled the Democratic Party long before the Age of Clinton. The Democrats used to be the party of big ideas, now they’re the party of big data. I would include the Republican Party in my analogy, but there is no baseball equivalent to them, aside from the block of owners who kept African Americans out of the game until Jackie Robinson busted down their doors. We need the Democrats to pull us out of this nosedive, and that requires a shift left. To socialism? Sometimes, sure. Social security is a great idea, and it literally has socialism in its name. We need to stop constantly trapping ourselves in “isms,” and learn the right lessons from history, as opposed to simply trying to replicate our retelling of it. It’s not just about ideas either, but also the infrastructure to effectively distribute them to those in power. We need truly liberal think tanks and policy centers cooking up implementable policies for liberal politicians to enact across the country. The entire democratic establishment is dominated by a blood-sucking consultant class, and we must find ways to bring better policy options to our politicians’ doorsteps. The truth of the matter is that politicians don’t write laws, lobbyists do. This is why the efforts of Data for Progress and People’s Policy Project are so important. One look at all the 2020 hopefuls in the Democratic Party reveals their understanding of the power of the left flank, as those like Kamala Harris and Kirsten Gillibrand signed on to Bernie Sanders’ Medicare-for-All bill. Liberals should be liberal. That’s the lesson that some in the Democratic Party refuse to learn from the debacle of 2016. “isms” are useful to help craft specific policy, but are far more difficult to use as overarching governing principles in a complex world. The 2016 election has poisoned a much-needed discussion about what the American left truly is after the semi-failure of the Obama Presidency. The Democrats’ fealty to unfettered capitalism is shielding us from the Barry Bonds’s of the policy world, and we need to redefine what government means in an increasingly inequal society. Let’s hope that in our age of ubiquitous data, like baseball, the left won’t allow a broken ideology to trap us in the same medieval logic that got us in this mess. “Capitalism” as we know it is dead, and it’s time to expand our horizons beyond the Age of Clinton and think about liberalism from a wider angle. History is still an instructive—yet imperfect—guide, and it should not be ignored, just properly considered. Franklin Roosevelt used a quasi-socialist government to help drag us out of the Great Depression, while Lyndon Johnson enacted massive and massively beneficial social programs that still stand to this very day. Our present financial conditions are quite different than FDR’s before the New Deal, but in the same way that Barry Bonds learned to hit thanks to the foundations laid by Babe Ruth, it’s now time for this generation of liberals to heed the lessons from the victories of the past and apply them to modernity, as the American economic experiment needs to be saved from itself yet again.